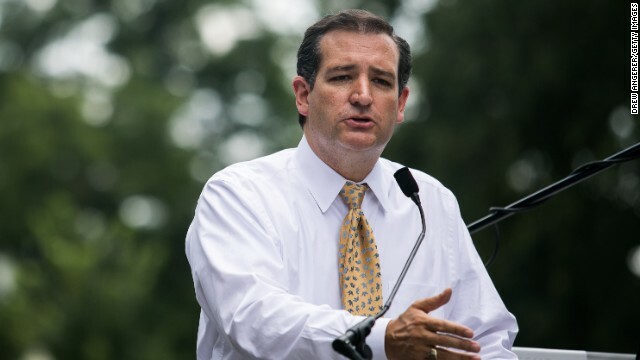 The next day, Cruz will hold events in the southern part of the state. Cruz was last in New Hampshire in late April, when he keynoted the Carroll County Republican Committee fundraising dinner and headlined an event by Citizens for a Strong New Hampshire. Earlier that month Cruz spoke at a "Freedom Summit" in the Granite State, which was organized by Citizens United and Americans for Prosperity. Cruz, popular among tea party conservatives, also made swings earlier this month and in March through Iowa, the state that kicks off the presidential caucus and primary calendar. And he's also visited South Carolina, which holds the first southern contest. He is polling was at 4% in NH, compared to the man of many Mittens at 38%. Some have said his trip is only to promote his coloring book and brag about the government shutdown and taking over the house speakership. "According to a source close to the senator, Cruz will speak at the Hillsborough County Republican Committee Primary Dinner on September 6. Another potential 2016 contender, Louisiana Gov. Bobby Jindal, will also give remarks at the dinner." Works for me. Hope they eat well and have fun. I know, I know ... whatever. Will the bagger ever learn that just because it plays well in Texas, does not mean the clown will gain support nationally. One would think Perry proved that point beyond a shadow of a doubt. And "pain killers" seems to be the go to excuse for the GOP, per lardbutt Limbaugh. New Hampsire will need to be cleaned after his visit. NH is pretty far north. Can Ted see his homeland from there? The Republican Clown Car will have an exceptional class of passengers this election cycle. With his record of shutting down the govt, he is anti-govt. He reminds me of GWB who is trying to establish a ' Leadership Center. Well an important law of conveyance says you cannot give what you don't possess. Cruz anti-govt stand means he cannot run a govt whereas GWB as an exemplary failure in governance definitely would be in no position to understand what good leadership is about. Other words a reincarnation of Nigeria's maximum leader Abacha could as well teach the world good leadership. Cruz just recently became a naturalized U.S. citizen. Having been born in Canada of an American mother and Cuban father, he is not eligible to be POTUS. Rigjht, all you birthers who claim President Obama is disqualified because he supposedly was born in Kenya of an American mother and Kenyan father? "Earlier that month Cruz spoke at a "Freedom Summit" in the Granite State, which was organized by Citizens United and Americans for Prosperity." cruz speech consisted of phrases such as... "I am for freedom, because I love freedom, and will always be against the freedom hating freedom haters." Messiah complex Cruz's support among TEA drinkers shows their lack of brain cells. Too much "shine' I guess. Maybe crank. To all you folks blaming President Obama for ISIS becoming armed due to the U. S. military support of the Syrian rebels, the repub/tea bags begged for that support. You all also might remember U. S. support for afghan military support of those fighting the Soviet Union – which morphed in the Taliban which counted Osama bin Laden among its numbers. Cruz should crap in his shoes and run a marathon. It would be 100% more helpful to the rest of the country than his turd-flinging political career. "Will the Birthers Scrutinize Ted Cruz U.S. Citizenship?" "It's pretty much the same exact circumstances as you complained of when it was Obama, so aren't you going to throw a nutty?" "Nah, it's totally different this time." "You can tell he's a citizen." Ted "one term senator" Cruz. This buffoon stands about as much chance of being president as I do. It's overwhelmingly hypocritical that anyone would consider Cruz a WH contender. He's a foreign born freshman Senator. And yet they had the mitigated gall to complain about President Obama. Whom they still claim was born in Kenya. And claim he didn't have enough experience. But what's Cruz' experience? Shutting down the government and reading but not understanding Green Eggs and Ham? But in their defense he is shades lighter than President Obama.... And that's ALL that matters to them. Every time I see a picture of this guy or see him on television in an interview I have this overwhelming desire to take a long hot shower with a sandpaper wash cloth. Eeeeewwwwwww.... he is just slimy.